Madam le Consul (aka: Cassandra Was Right) is a senior consular-coned US Foreign Service officer who has served in 23 countries and Washington.Since May 2009, she has been blogging in The Consuls’ Files, “bringing humanity, common sense, realism and humor to the work of the US consul.”And she did that and all in the short, short life of her blog. I think late last Friday, the blog (and the blogger) simply disappeared into thin air. I thought it was a simple technical glitch. But by Monday, I know it wasn’t. She is a regular blogger, Monday-Friday; she has last posted Friday morning. If you look it up now, Blogger would tell you that it cannot locate such a blog. Just like that, it went – puff! Of course, if you do a search for Madam le Consul, Google still spits out the cache files of the now missing blog. The question is where is Madam le Consul? And what happened to The Consuls’ Files? Like any amateur detective, you have to start with a list. So below is Diplopundit’s list in what we hope will turn out to be a massive blog hunt with the help of some friends. #1.Did Madam le Consul pull down her own blog? This is always a possibility.The Hegemonist has been gone since June and I am doubtful if he will return.But — MLC is a consular officer with a lot of experience and a lot to say.I know that she has become a popular read very quickly.Why would she pull down her blog? Besides she’s big on doing the right thing, she would not close shop without a proper goodbye. No, she did not do this on her own. #2. Was Madam le Consul (and her blog) abducted by Martians? Okay, we’ve considered this.But — MLC is a consular officer; given her experience, she’d be negotiating her release by now. I cannot imagine that she’d be scared silly or easily, not even by aliens from space. If she does not show up by the end of the week, we know that the somebodies got her. And they’re not from outer space. #3.Is Madam le Consul in an undisclosed location? MLC could be writing a book that will bring more humanity, common sense, realism and humor to the work of the US consul. We’ve thought about that but we know she’s not in Tora-Bora.Again, if she has decided on her own to disappear for a while, she would have left a note.She’s a diplomat; she knows it’s impolite to leave without a word. #4. Did Diplomatic Security catch up with Madam le Consul? And told her to zip it?There is always that possibility.But see, DS is busy with all sorts of things right now; from security contracts, contractor investigations, staffing issues, returning fugitives, security investigations, etc. etc. Can you imagine DS spending its limited resources hunting down a blog and shutting it down?I can’t. Besides, the blog Dead Men Working, whose bloggers very closely follow Diplomatic Security has been around a while and when I last checked, Steve is still on. Unless there’s a witness, I don’t think the culprit is DS. Diplopundit’s friends are not so sure. 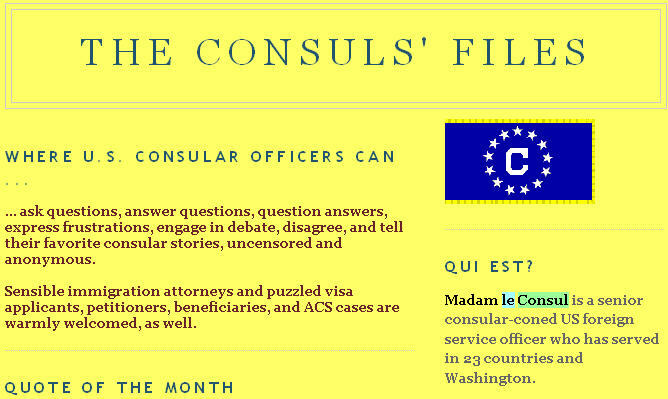 #5.Did the Consular Affairs Bureau shut down Madam le Consul? Did the good folks at CA issue a cease-and-desist order to gag her?MLC is a senior consular-coned US Foreign Service officer who has served in 23 countries and Washington.How many officers would fit that description like a glove? And which office would be able to dig up and match that description quickly?MLC has also been blogging about consular issues and her posts have been excerpted in Liam Schwartz’s Consular Corner, which is read by consular officers, and by folks in the CA Bureau (motive and opportunity? ).Makes us wonder if “controversial” blogs have now become line items in the agenda of executive meetings at Foggy Bottom. Is the Consular Affairs Bureau (under M) responsible for the disappearance of Madam le Consul and her blog?If it is, who gave the order and why? How many manhours were used to track her down?Has she been thrown into a visa dungeon with no internet connection? The hunt for Madam le Consul in on.Anonymous tips are solicited here.